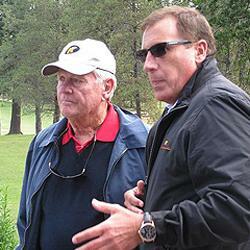 Jack Nicklaus (left) looks over the course his firm helped to expand and renovate. After our speakers and a tour of clubhouse and training room, on to the course itself! 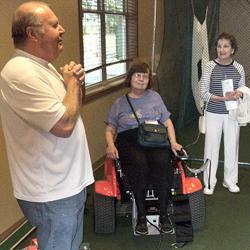 Roger Gatts demonstrating special cart for legless vets with help of audience member Marilyn Swartz. Thanks to the involvement of the man many consider to be the greatest golfer of all time, the scene of our monthly program for July 2013 is in the news again. The only golf course in the United States designed to be played by disabled veterans is supported entirely by volunteer labor and private donations (the Veterans Administration stopped funding of golf courses in 1995). 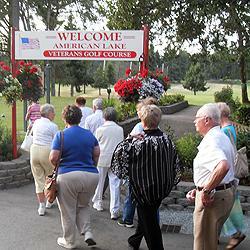 The American Lake Veterans Golf Course (ALVGC) in Lakewood is an inspiring testimonial to both community spirit and the unconquerable determination to overcome obstacles on the part of individual vets. Our host at the beautiful new clubhouse and first speaker was Roger Gatts, the Assistant Manager of the American Lake Veterans Golf Course. The second speaker was Jim Sims, current president of the Friends of the ALVGC, followed by Harold "Pepper" Roberts, President Emeritus. Like everyone else connected with the course, they are all volunteers and we thank them for an informative and inspiring evening. Details and more photos can be seen on our Facebook page.